The 3 Ton Power Drive Gantry Crane from BHS provides safe and easy vertical extraction for most standard forklift batteries weighing up to 6,000 pounds. These cost-effective and rugged gantries provide a quick return on investment by speeding up changeout times and keeping your fleet moving. Our power-drive gantries use the latest variable-frequency-drive technology to provide smooth acceleration and deceleration. A Cable Festoon Kit protects gantry operators from accidents by securing cables during use. Our powder-coated steel components ensure that BHS gantries won’t fail even in harsh battery room conditions. 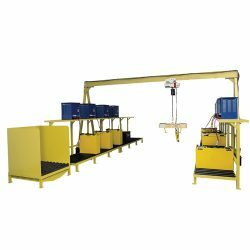 The 3 Ton Power Drive Gantry Crane comes with a multitude of wheel and track options and offers several other optional features. The modular design of this gantry allows for easy system expansion. Make battery extraction quick, safe, and easy with a 3 Ton Power Drive Gantry Crane. Call +1 314 423 2075 to speak to a sales member or find a dealer near you.